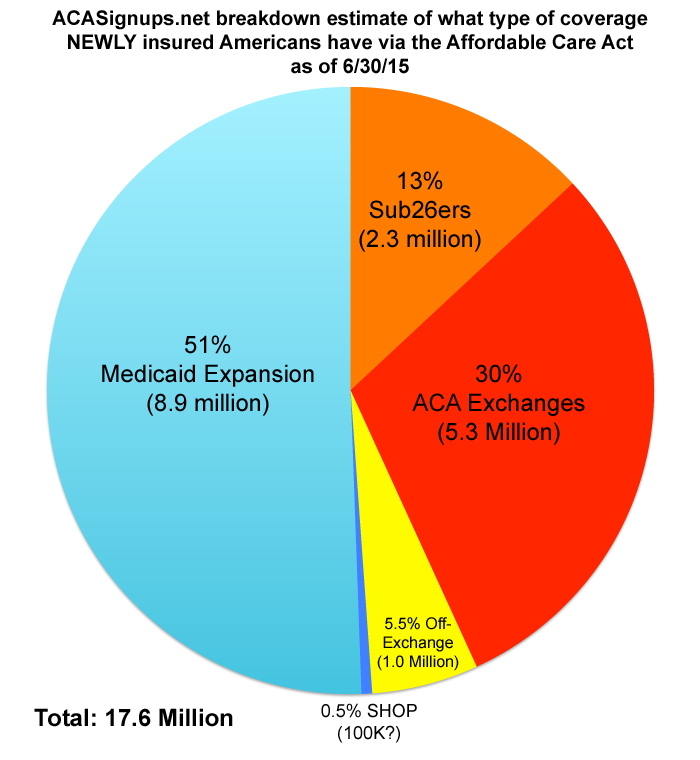 Home » Blogs » Charles Gaba's blog » UPDATED: ACA surpassed CBO target without achieving CBO target. Seriously. UPDATED: ACA surpassed CBO target without achieving CBO target. Seriously. In 2014, there was a tremendous amount of focus placed on whether or not "Obamacare Enrollments" (specifically referring to private ACA exchange enrollments) would or wouldn't hit the seemingly all-powerful target of 7 million people. Hell, the original (and still primary) focus of this website was specifically to do live tracking of private ACA exchange enrollments across all 50 states (+DC). How did the "7 Million" figure become so all-powerful? As long-time readers (or anyone who remembers the past 2 years) will recall, "7 Million" took on an almost mystical quality. The media, along with detractors and supporters alike, began treating it as a make-or-break number; if the administration was able to hit the 7M mark, all would be well, and if they didn't, the earth would open up and swallow the entire nation whole. I should also note that rightly or not, "13 Million in 2015" seems to have become the "...Or Bust!" number of private QHP enrollments to reach the 2nd time around. I'll say it here and now (not for the last time, not that anyone is likely to listen): Neither the "7 million" figure from last year nor "13 million" this year are "pass/fail" targets. The ACA isn't going to collapse into ruin if the number next year ends up being, say, 11 or 12 million instead of 13, just as it wouldn't have been a failure if it had only hit 5 or 6 million this year. The CBO was just projecting what they thought was likely to happen, not what they felt was necessary for success. Former HHS Secretary Kathleen Sebelius was largely responsible for the "7M or bust" meme by answering the question "What does success look like?" by responding "At least 7 million people having signed up by the end of March, 2014." That doesn't necessarily mean that any number lower than 7M would have been a failure. Think of it this way: If I won $50 million in the lottery, I'd define myself as "rich". However, if I won $5 million in the lottery, I'dalso define myself as "rich". Regardless, 7 million became the enrollment target last year...but no, the HHS Dept. didn't end up surpassing the Congressional Budget Office's target, because the CBO was projecting an average of 7 million people being enrolled and paying their premiums each and every month of the full fiscal year. As you can see, while the total number of policies selected during open enrollment last year did indeed break 8 million (and yes, there were 7.1 million of them as of March 31st, not including the "overtime" period tacked on in April), when you take into account non-payments, normal attrition/churn, 112K people being kicked off due to legal residency issues and especially the "April/May start" factor (by far the largest), the average number enrolled per month was only about 5.5 million. The Census Bureau has finally released definitive statistics on the number of uninsured in 2014 and the news is not good for Obamacare (unless, of course, you have abysmally low expectations for government performance). 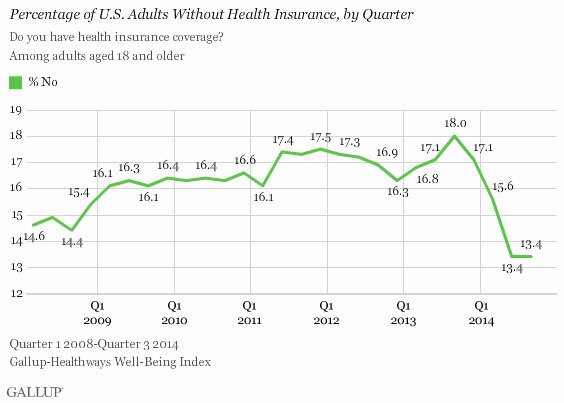 The population-wide uninsured rate fell from 14.5% in calendar year 2013 to 11.7% in 2014. The total number of uninsured dropped from 45.2 million in 2013 to 36.7 million in 2014–a net of 8.5 million who gained coverage . OK, that's a minor difference, but 300K people is still 300K people. Obviously if you average out all 4 quarters of 2013, you'll get a lower uninsured rate (17.25%) than starting with the quarter just before the exchanges launched...and averaging out all 4 quarters of 2014 would eventually yield a slightly higher uninsured rate for the full year than any single quarter (13.8%). So...which one of us is "correct"? Both are, actually, because we're answering different questions. The very same CBO report also projected that the total uninsured rate including undocumented immigrants would be down to 14% by this year, and down to 11% if you exclude that group. Let's read that passage from Chris Conover's piece again, shall we? Only 13.3% were uninsured at the time of the CDC interview in 2014...and that was down to 10.7% earlier this year. A less generous reading would look at the second column, which tracks how many were uninsured for "at least part of the last year". By that standard, the ACA is indeed still coming up a bit short at 15.8%...but only slightly. I don't think even Conover would describe a 2-year reduction from 20.4% to 15.8% (instead of 14%) as "badly underperforming", though I could be wrong. Depending on the measure you use, the ACA has either more than surpassed the CBO's 2nd year projections in the first year or, at worst, is currently slightly behind CBO projections. The overall uninsured number is down to anywhere between 29 - 33 million people as of this summer, depending on whether you use Gallup or CDC/NHIS survey results as your basis. 14.5% of the population is 65 or older, leaving around 274 million under 65. Even if every one of those 29-33 million is under 65 (and a small number aren't), that's still at worst a 12.0% uninsured rate as of this year, or 10.6% at best. There you go...for the under 65 population only, the total uninsured rate for the full calendar year dropped from 15.3% in 2013 to just 12.0% in 2014, or a 21.6% drop. Of course, the CBO claimed that the uninsured rate for those under 65 started out at 20% instead of 15.3%. Obviously they used a different methodology to come up with that, and they round everything off to the nearest percent point anyway, but even if you use that as your starting point, a 21.6% drop would bring it down to 15.7%, still impressive. ...to which I respond, "Yeah, and your point is???" The main goals of the ACA are to maximize decent healthcare coverage and to keep people from being bankrupted in the process. The second part of this is still very much open to debate, of course (the premium/deductible/co-pay issue is a legitimate one for many people), but the coverage expansion success cannot be denied. First, they do have to reach a certain threshold in order for revenues to cover the operating costs of the state-based exchanges. Second, the risk pool of enrollees in the overall individual market (both on and off-exchange) needs to be of a certain mix in order to avoid a premium "death spiral"
In other words, let's say that 5 million additional people decide to enroll in individual policies next year off of the exchanges (paying full price to do so). They would still be counted as part of the individual market risk pool*, so it wouldn't matter that they didn't run through HC.gov or the state exchange sites (although in some states, this would adversely impact the exchange budget). *UPDATE: Thanks to Louise Norris for pointing out that this isn't necessarily true for every company in every state; some companies only offer policies on or off the exchange, not both. In those cases, anyone enrolling off of the exchange wouldn't be included in the exchange-based risk pool. Or, let's say that there's a massive hiring binge, and 2 million additional people suddenly have jobs with full employer-sponsored coverage. That wouldn't add a single person to the exchanges...but it would still be another sign that the ACA is successful. In short, the fact that this expanded coverage is weighted more on the Medicaid side at the moment than the private policy side is interesting, but does nothing to weaken the fact that the ACA has already expanded healthcare coverage in the U.S. beyond what the Congressional Budget Office thought it would.